This issue's article is by Richard Blum, an actuary living in Florida, and Vedic Math expert who has recently set up the Vedic Math School. This is now available for all your VM teaching and training needs. Please see www.vedicmathschool.com and the article at the end of this newsletter. This introductory course will be held at the Idler Academy (81 Westbourne Park Road, London W2 5QH, tel: 0845 250 1281). It starts on 15th May, 6.30 for 7pm and will run for 9 Tuesdays. The course will be given by James Glover, a long-standing expert in Vedic Mathematics. Please visit http://idler.co.uk/shop for more information. The groundbreaking new book 'Pebble Maths' by Vera Stevens is now available at her website: www.pebblemaths.org. Vera's approach to teaching mathematics to beginner learners is hugely effective and the perfect start for learning Vedic Maths. The first gives the background, history and main features of the Vedic system, and the second contrasts the Vedic and conventional approaches through a series of examples. An article by Vitthal Jadhav titled "Faster Division by 10n-1 or Monodigit Number" is now in our online Journal. This proves, and gives an example, of special divisions of the type: 123475/7777 where the divisor consists of a string of the same digit. As you probably know many changes have been made to this website and it has changed hosting provider. If you find any broken links at the website www.vedicmaths.org please would you let us know at . Any other comments also gratefully received. Thank you. The current teacher training course at e-gurukul.net ends this month. The course is going very well with much discussion and interest. If you are thinking of joining a future run of the course the best way is to subscribe to the VM Newsletter as you will then be informed how and when applications can be made. When multiplying any no. which end with 5 ,first add the first digit of both no. if its an even(multiply with 2) then answer must contain last 25 and if its odd(not multiply with 2) no. then its end will be 75. 3. multiply both first digit and add this half. 3 half of 12 = 6 so take this which is complete natural no. u can even multiply 3 or 4 digit no ending with 5 too. On April 28th, the Vedic Math School officially went on-line at vedicmathschool.com. It was determined by Vera Stevens, Kenneth Williams and Richard Blum, 3 internationally known Vedic Math (VM) teachers, that it was time to meet the needs of a growing number of students around the world that want to learn VM. 1. Vera Stevens, an Australian teacher, teaches her system of mathematics, called "Pebble Maths," to young and old alike, who are either totally innumerate and/or have very weak skills in basic math. In a relatively short period of time, these students are brought up to speed in their mathematical ability to then study Vedic Math. Vera has been perfecting this system for the past 15 years teaching children and innumerate adults in Australia the mathematical skills that many in other areas of the world take for granted. Vera has just published her first book, "Pebble Maths," and it may be purchased at her website pebblemaths.org. 2. Richard Blum, an Actuary and Vedic Math teacher who resides in the United States, teaches VM at the elementary, intermediate and advanced levels. Rick has taught various groups from grade school children to PhD candidates over the last 15 years both nationally and internationally, on-line and in person. Over the years, Rick has observed the growing need for a no nonsense approach to teaching VM that has found favor in many areas of the world. Along with Kenneth Williams, he assisted in the first Vedic Math Teachers Training Course which produced almost 40 Vedic Math teachers in 17 countries. A basic syllabus of Rick's courses may be found at vedicmathschool.com. Depending upon the need, Rick will customize the content of a course to best meet the needs of the individual students or groups. 3. 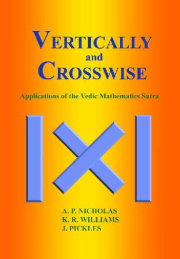 Kenneth Williams, a world famous mathematician and pioneer in Vedic Mathematics, teaches a course which enables individuals to become certified as Vedic Math teachers. Kenneth has been actively involved with Vedic Math since the early 1970's and has written many books on the subject as well as producing two sets of DVD's providing instruction in VM. A resident of Scotland, Ken has travelled around the globe teaching VM. His reputation as a teacher and VM scholar is unsurpassed. The impetus for establishing the Vedic Math School was a response to the proliferation of so-called VM teachers/schools promising to make students "human calculators" or "math geniuses" by just taking their short class. The results of these courses fall far short of what they promise. In addition, VM is characterized in many places as a bunch of tricks and gimmicks. Nothing could be further from the truth. The three teachers that form the faculty of the Vedic Math School know from their years of experience that the way a student learns VM is in a structured, coherent and complete manner. These teachers, that have experienced the beauty and functionality of VM for a combined total of over 70 years, have the ability to convey their knowledge to students. For more information about the Vedic Math School, please visit vedicmathschool.com.